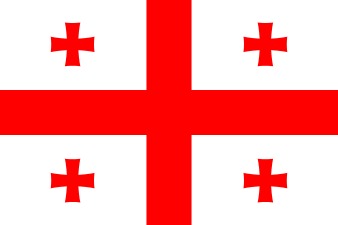 Georgia a unitary state, whose borders are defined by the law as corresponding to the situation of 21 December 1991. It includes two autonomous republics (Georgian: ავტონომიური რესპუბლიკა, avtonomiuri respublika), those of Adjara and Abkhazia, the latter being outside Georgia's effective control. The former, Soviet-era autonomous entity of South Ossetia, also not currently under Georgia's de facto jurisdiction, has no final defined constitutional status in Georgia's territorial arrangement. The territory of Georgia is currently subdivided into a total of 76 municipalities—12 self-governing cities (ქალაქი, k'alak'i), including the nation's capital of Tbilisi, and 64 communities (თემი, t'emi). The municipalities outside the two autonomous republics and Tbilisi are grouped, on a provisional basis, into nine regions (mkhare): Guria, Imereti, Kakheti, Kvemo Kartli, Mtskheta-Mtianeti, Racha-Lechkhumi and Kvemo Svaneti, Samegrelo-Zemo Svaneti, Samtskhe-Javakheti, and Shida Kartli. Tbilisi itself is divided into ten districts (რაიონი, raioni). The two autonomous republics, Abkhazia and Adjara, were established during the Soviet regime and are recognized by the modern Constitution of Georgia adopted in 1995. The self-governing community of Khulo. As a result of the military conflicts in 1992–1993 and 2008, Georgia has no effective control over Abkhazia, whose declaration of independence is recognized by Russia and three other UN member states. Georgia considers Abkhazia as its autonomous republic, whose government sits in exile in Tbilisi, and currently an occupied territory. Abkhazia's territory, in the Kodori Valley, which had been under Georgia's control prior to the Russo–Georgian War of 2008, is de jure the self-governing community of Azhara. Abkhazia's secessionist government divides the entity's territory into seven districts (raion). 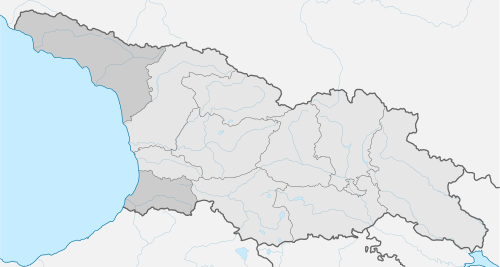 South Ossetia enjoyed the status of an autonomous oblast in the Soviet era. After the military conflicts in 1991–1992 and 2008, Georgia considers the former Autonomous Oblast of South Ossetia an occupied territory. 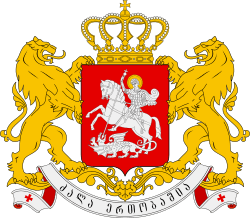 Its status is not constitutionally defined by Georgia, but there is a Provisional Administration of South Ossetia sitting in exile in Tbilisi. The territory which had been under Georgia's control prior to the Russo–Georgian War of 2008, was organized into four municipalities, which retain their de jure status. 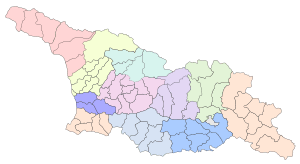 South Ossetia's secessionist government divides the entity's territory into four districts (raion). The laws of Georgia include a notion that the final subdivision and system of local self-government should be established after the restoration of the state's sovereignty in the occupied territories. Regions (mkare) were established by Presidential decrees from 1994 to 1996, on a provisional basis until the secessionist conflicts in Abkhazia and South Ossetia are resolved. They roughly correspond to the traditional principal historical and geographical areas of Georgia. A region is not a self-governing unit; its function is, rather, to coordinate communication of several municipalities (with the exception of the municipalities of Adjara and that of Tbilisi) with the central government of Georgia, which is represented in a region by an official appointed by Prime Minister, the State Commissioner (სახელმწიფო რწმუნებული), informally known as "governor" (გუბერნატორი). According to the Georgian law, a municipality is a settlement or a group of settlement with defined borders and self-government. There are two types of municipalities—self-governing cities, 12 in total, and self-governing communities, 64 in total. The current municipalities were established from 2006 to 2014. Most of the municipalities recapitulate the boundaries and names of earlier subdivisions, known as raioni (district). 1 2 3 4 5 6 7 8 "ტერიტორიული მოწყობა და მმართველობა [Territorial Structure and Government]". Administration of the President of Georgia. Retrieved 9 July 2015. 1 2 ადგილობრივი თვითმმართველობის კოდექსი [Code of Local Self-Government], Organic law No. 1958-IIს of 5 February 2014 (in Georgian). Retrieved on 9 July 2015. ↑ "Registry of Municipalities". National Agency of Public Registry. Retrieved 9 July 2015.